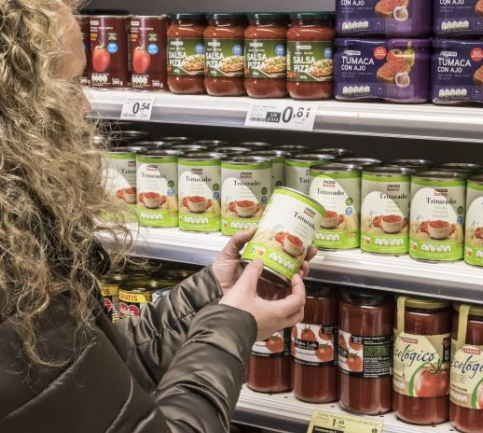 16 Jan 2019 --- Spanish supermarket chain Eroski has introduced a handful of own-brand products featuring Nutri-Score labeling. This makes Eroski the first distribution company in Spain to incorporate this “advanced nutrition” labeling. The Nutri-Score system classifies foods into five levels, indicated by colored letters – from “A” in dark green to “E” in dark orange. It is calculated on the basis of the calories, the nutrients which are beneficial for our health – fiber, protein, amount of fruit, vegetables, nuts and pulses – and nutrients whose intake should be reduced – saturated fat, salt and sugar – per 100 grams of the product. “Understandable information about the nutritional quality of food is essential to build a healthy diet and is also one of our Health and Sustainability Commitments. Therefore, at Eroski we try to keep at the forefront on information transparency matters and we go for the most advanced systems to help consumers have an informed opinion when devising their eating plan so as to be able to eat a balanced, healthier and sustainable diet,” says Alejandro Martínez Berriochoa, Eroski’s Health and Sustainability Manager. 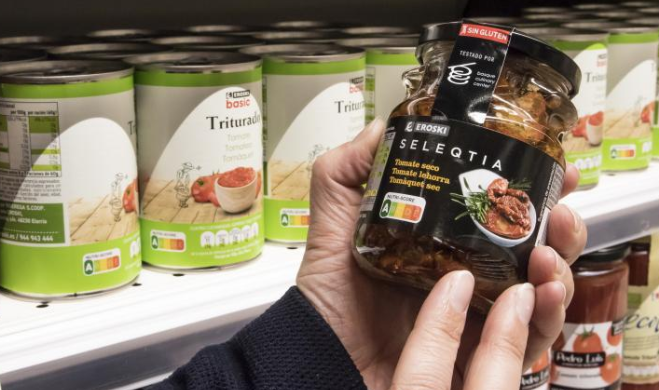 The first products with Nutri-Score in Spain are a tin of crushed tomatoes and a pack of potatoes to be steamed in the microwave, both under the chain’s own brand, as well as an Eroski Seleqtia-branded jar of dried tomatoes in oil. As the cooperative announced in early October, this new labeling will be gradually applied to all its own-brand food products. Click to EnlargeThe labeling system has been validated by the Ministry of Health and the EU, and is supported by the World Health Organization (WHO). It will be provided together with Eroski’s traffic-light nutrition labeling system, which has been present on all the chain’s own-brand packaging for over ten years. “Both systems are complementary. With this incorporation, consumers can easily find out the overall nutritional rating of each product so as to compare it to other similar ones and make a better choice, without losing the detailed information which is provided by the traffic light nutrition labeling,” notes Berriochoa. The cooperative proposed the Nutri-Score initiative to its Member Customers in September 2018 following a prior assessment of several existing nutrition labeling models carried out of food experts with the advice of the Eroski Scientific Committee. Eighty-five percent of the over 10,000 Member Customers who took part in the participatory process to validate the incorporation of the Nutri-Score were in favor of this initiative. Breaking down the results, 75 percent preferred the new labeling to be shown on ready-to-eat and pre-cooked items, followed by 73 percent who wanted to see it on sweet products, such as baked goods and biscuits. 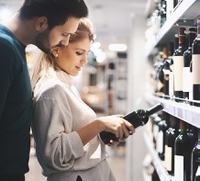 The importance of how the nutritional content of foods is communicated via labels to consumers has come under the spotlight in recent years, especially when seemingly healthy products are uncovered as containing high levels of sugar or salt. Food labeling regarding allergens has also come under review in recent months, intensified by the two allergy-related deaths of Pret a Manger customers, for example. In November, Kellogg announced that its UK cereal packs would feature color-coded labeling from this month. The news came as PepsiCo also announced that it would trial interpretative color-coded labeling for both beverages and foods in many EU markets, using the 100g/ml-based approach already voluntarily implemented in the UK and Ireland. Click to EnlargeThe first products with Nutri-Score are a tin of crushed tomatoes and a pack of potatoes, both under the chain’s own brand. The traffic light labeling scheme was introduced in the UK in 2013. The system labels products with green, amber or red, seeking to help consumers identify products that have low, medium or high levels of salt, fat and sugar. Across the pond in the US, the US Food and Drug Administration (FDA) has proposed the Nutrition Facts label, which aims to incorporate the latest evidence-based information on nutrients, such as added sugars, to provide consumers with more information regarding their food choices. Whereas, for example, the old label lists total grams of sugars, it didn’t distinguish between sugars that are naturally occurring in foods like fruits and vegetables and sugars that meet the definition of added sugars. The proposed label also would replace out-of-date serving sizes to better align with current portion sizes, and it would feature a fresh design to highlight key parts of the label such as calories and serving sizes. However, the compliance date for manufacturers with US$10 million or more in annual food sales was established as July 26, 2018; but it was extended in May to January 1, 2020. In the case of manufacturers with less than US$10 million in annual food sales, the compliance date was set as July 26, 2019, but now it will be January 2021.